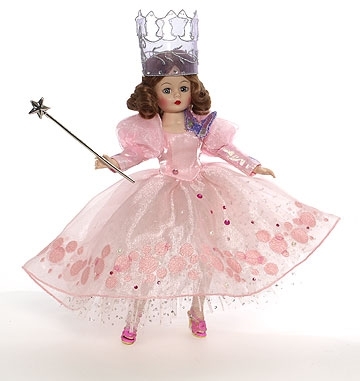 Magic Bubble Glinda The Good Witch from The Wizard of Oz, is a beautiful fully-articulated Cissette with blue eyes and flowing red curls, sparkles in a pink gown. The bodice and sleeves are sparkle-satin paired with a full skirt. The two-layer skirt has a pink sparkle organza, lined with white tulle, layer over one of pink tulle with silver sparkle. Embroidered trim and a lavender butterfly embellish the bodice and pearls and pink beads are scattered over the dress. Pink pantyhose with pink-shimmer net are worn with pink, open-toed sling-back shoes. Accessories include a crown of embroidered organza and applied rhinestones, and an elegant metallic wand.